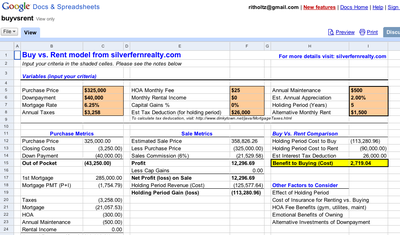 One of the very cool things about Google Spreadsheets is how fully web integrated it is. The web side of it is not an afterthought, but rather a key part of its design and construction. Yes, it is a basic analysis; But its so fascinating how easily apps of this type can be shared with anyone online. Expect to see a whole lot more of these kinds of applets as web integration accelerates. 1) How easily is it to integrate Excel -- a desktop app -- into the website versus a internet-based spreadsheet? 2) Have these free web based apps evolved to the point where they are a legitimate competitor to Excel? 3) How much share can this steal? This is a far more refined app than I previously perceived it to be . . . I think this is a bigger deal than it seems right now. The ability to easily share data is only one aspect. Another is portability. What if PCs evolve back to being just enhanced terminals? You won't need your laptop on a plane, just a simple terminal on the seat back connected to the Web. On a side note, that spreadsheet makes a common error in calculating tax savings. Since by itemizing, you lose the $10,000 standard deduction (for couples), your tax savings is only anything above that. The financial advatages of homeownership are totally exaggerated. He has $500/year for maintenance. Sure, except in years when you need to have the house painted, a roof replaced, a large tree removed, etc, etc. And where's the cost of the water/sewer bill? No renter pays that. And how about liquidity? A renter can simply move once the lease has expired. Selling the house takes months. Add negative equity growth to the mix and the case for renting is a no-brainer.